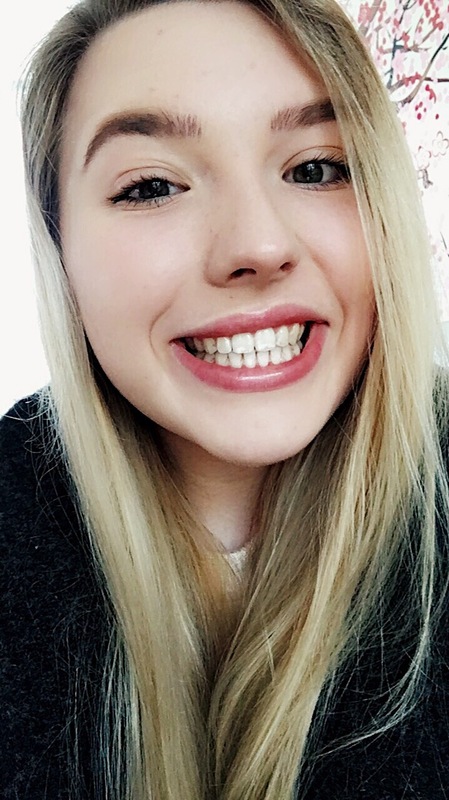 As of Friday 9th March, I am official brace free! It took just over a year for my teeth to go from crooked to straight. Seeing the before and after photos of my teeth is crazy to see the difference. 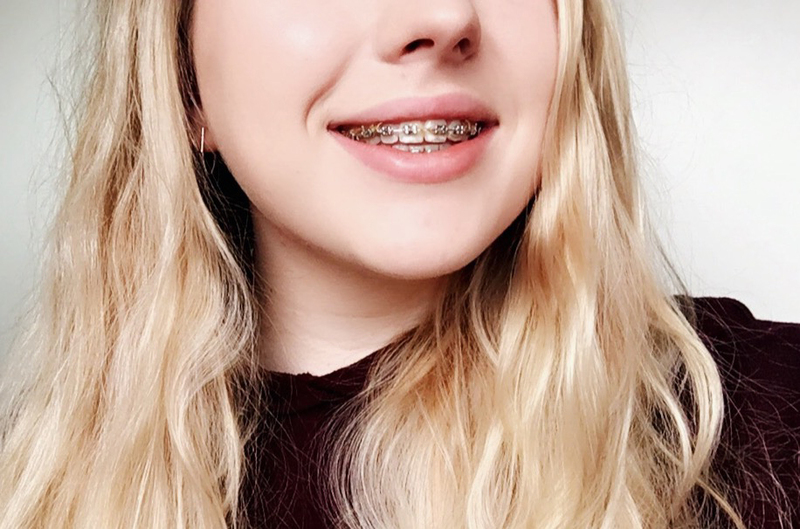 I felt it was worth sharing my experience of having braces as it was a daunting thing at first. This has been my experience, and I’m sure it will be different for each person so no two processes are the same. The whole process of getting braces was the most difficult at the very beginning. It took me ages to get accepted for them as my teeth were considered borderline. 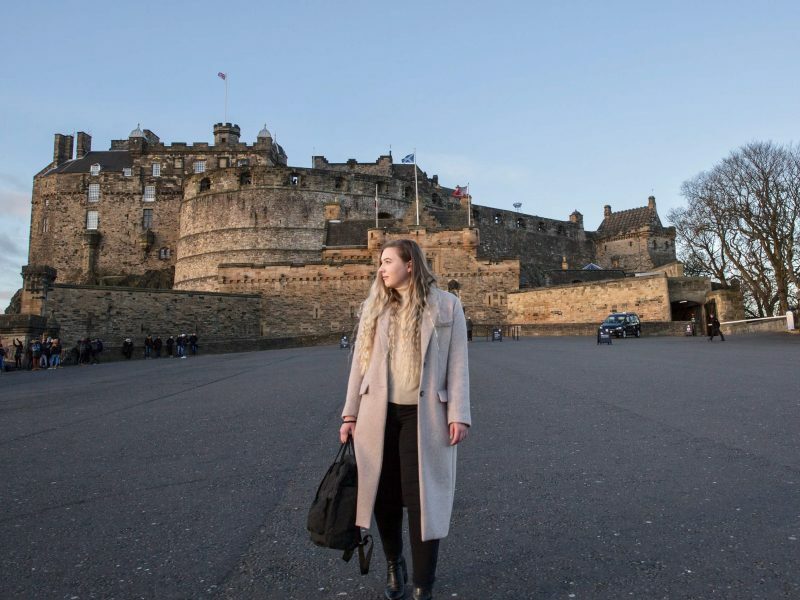 The government had recently changed criteria when I was trying to get braces, which meant I would have been accepted previously but after the changes, I was no longer seen ‘severe’ enough to get them. There were a few trips to the Hospital, X-Rays on my teeth and plenty of consultations. Each one turned me down and told me that my teeth were fine. It was so disheartening as I hated my teeth so much, to the point where I hated smiling. I would talk to strangers with my lips covering a lot of my teeth because I disliked the way my mouth looked. It really knocks your confidence. I was considering going to a Private Dentistry to get Braces, but not everybody has over £2000 to drop on teeth. This was my teeth before I had my braces on, the top teeth were a lot more crooked than my bottom teeth. As my molars were coming through my teeth were gradually getting worse, I think I was about 1mm off being accepted for braces on one tooth which twisted quite far back by a few mm. I was actually referred to the Head of Dentistry in the Practice by a Nurse who said my teeth were in need of correcting. After that meeting, I received a letter which told my teeth had moved to the point where I met the criteria. But that still came with a few complications. The Dentist had to apply for funding in order for me to get it done. Which would have delayed the process for an uncertain amount of time? Thankfully 3 people dropped out and declined to get braces. This meant I was able to receive the funding from them in order to get the procedure. Which I was forever grateful for and meant I would finally be able to get the treatment. I was turning 17 at the point when I finally got accepted, I believe the cut off to get braces on the NHS is 18. Since my treatment started before I turned 18, I was still eligible for the treatment even after the cut off age. This was after I had top teeth removed from my mouth. I wore the bottom braces for a while before the top brackets were applied. After this, it was time to meet my Orthodontist who would be placing the braces on and tightening them. This was good as I got used to seeing one person who knew what was needed and how far my teeth needed to move. A familiar face is always welcomed. I was able to get braces on my bottom teeth first as no teeth needed to get pulled out from here. But there was a delay which was about a month from when the bottom brackets were fitted to when the top ones were applied. I needed to get two top teeth taken out with the recovery time after that before I was able to get top brackets applied. Having teeth removed wasn’t that bad. I had two out in total one of either side which was removed at the same time. The least pleasant part was the needle going into the top section of my mouth. It was a slight pinch but nothing too crazy. One side of my mouth needed a greater volume of Anesthesia injected into it. This was because I could still feel the pressure when the tooth was being pulled. One half of my face swelled up from this and my lip puffed up with a bruise as well. It looked a lot worse than what it was. For the evening I spent my time tapping my cheek as I was unable to feel one side of my face, and I found it very amusing. I was careful for the following week to eat soft foods, drink water which wasn’t too cold, and brush carefully around my mouth. After this had settled down it was time to get braces on. The braces that were placed on my bottom teeth were a little painful but it didn’t impact me too much. I didn’t really notice they were there. I think the worst part of this was my braces imprinting onto my bottom lip. It caused a bit of rubbing as this was something metal in my mouth. My bottom teeth were not as bad as my top which meant I did not prepare for the pain heading my way from the top teeth. Soup and mushy vegetables and meat were my best friend for a good week to two weeks after I got my top braces on. It was tender to even rest on my face, the teeth were so painful, the slightest touch would cause agony. The pain was unbearable on my top braces but tolerable on the bottoms. I think my mind has blocked out the memories of the pain so I don’t actually remember the full extent of it! This was one of the colour choices I went with during my time having braces, there is quite a significant curve along the bottom which was straightened out as time went on. The pain difference was mostly due to how much the teeth were out of place and needed to be moved in order to go straight. So the wonkier the teeth the worse the pain. As time goes on the pain gets less and less, but I still found myself reaching for softer foods whenever I got my braces tightened. Another thing that caused a lot of pain would be the wire being a bit too long. It would dig into the inside cheeks and create cuts on the sides. The brackets also created an imprint onto my lower lip which was a result of it resting against my skin. If it got too bad I would use some painkillers, Bonjela and wax strips which would create a smooth barrier over the brackets. The wax strips were a one time use only and bits would start coming off and it became quite slippery. So this wasn’t useful and it didn’t solve the problem. I stopped using those after a few months when my mouth became a bit more familiar with these foreign objects. I still had to deal with wire stabbing me every time I smiled. Yay! So make sure to get the Orthodontist to cut the wires down on the ends, or else you are in for 6/8 weeks of raw cheeks. I loved having my braces. I was so desperate to get them as I despised the way my teeth looked before. But one thing I disliked the most out of the whole process was the food getting caught in the brackets. Bread! Bread was the worst out the lot as it would get caught between every single bracket and was such a pain to pick out. I had small brushes that are designed to go between the brackets. But let’s face it, whipping one of them out in the middle of a restaurant is not the most pleasing sight. 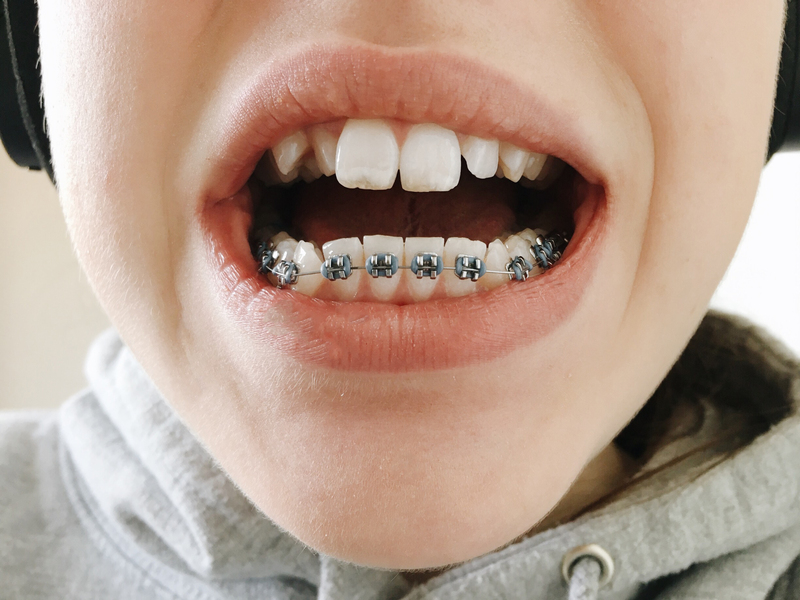 This would be the one grievance I had during my whole braces experience that was non stop. But I learnt to deal with it. Carrying a small mirror really helped out loads because a quick smile can ensure you don’t have a huge piece of lettuce sticking out your mouth. It just one thing that was the ‘norm’ when getting braces. Towards the end of my treatment, it was just sorting out minor issues. My two front teeth had an annoying gap at the bottom which I wanted closing up. In order to do that, the Orthodontist needed to file away my tooth which is one of the worst feeling ever. I’m squirming now as I recollect on that is it feels awful. I hate when nails are being filled, the noise goes through me so teeth filing is a lot worse. Overall this added about 2/3 months delay before getting my braces off. This then leads me onto Friday, when my braces were gone. The actual process of getting them off was quite quick, a few snaps of the brackets and they were gone. What took the longest was filing away the glue which wasn’t pleasant. It was the same kind of experience as getting my centre teeth filed. I have quite sensitive teeth which didn’t help the matter so I was glad for that to be over. As the process of teeth straightening went on I noticed the wire became a lot thicker. If you compare the wire here to the previous you can see this is a thicker gauge. This resulted in my teeth being tender after it was tightened, but I saw progress a lot quicker. But seeing the results was amazing, remembering what my teeth were like before to know is such a big transformation. I spent the rest of that day smiling at people and running my tongue along my teeth. Everything was so smooth compared to the metal on there before! The enjoyment of straight teeth is great until you need to start wearing retainers. 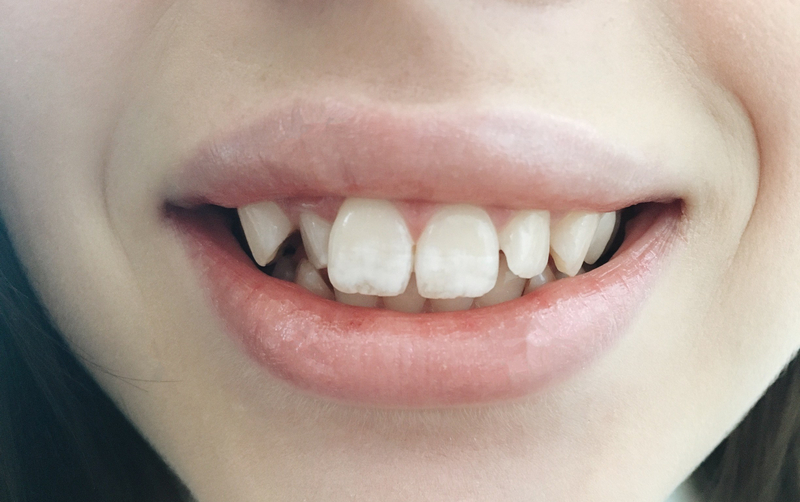 After getting braces off a mould was taken of my teeth which are then turned into the retainers. I picked up my retainers on Tuesday and in the space of 3 days I could feel my teeth had moved ever so slightly. For the next 48 hours, I had to wear my top retainers non-stop. Only taking them out to eat. Which include daytime and nighttime wear. I only need to wear my bottom retainers at night time. As for cleaning them cold water, a toothbrush and soap are all that is needed so really low maintenance. This is my teeth now, and I couldn’t be happier. For me there was a few things that made the whole process of getting my braces a lot easier. The first thing would be the Orthodontic Wax. On days when the brackets were making my gums tender or the wire was too long I would break some wax off and out it on the pressure points. As my mouth became used to the brackets I found myself using it less, but it’s great to have in the beginning. The next thing that was purchased was tooth brushes specifically designed for braces. When I was out and about I would used Interdental Brushes that would fit between my brackets to help get food out that was stuck as well as ensuring those areas were clean. The next type of brush I used was one with a ‘V’ Shaped Brush head and a small brush on the other side. The ‘V’ shapes bristles were great for going around my brackets and ensuring my teeth were properly cleaned, then I used the other side to get between my teeth. All of these I first recieved in a Braces Starter Kit from my dentist which covered all of these things as well as a small compact mirror so I could periodically check up on my teeth throughout the day. If you are interested in any of the things mentioned here then I have popped the linked to the items below. These really helped me, and I hope you find them useful too. Overall I loved the process of getting braces. Braces did a lot more than straighten my teeth, it gave me confidence. I am no longer ashamed to smile. If you are thinking about getting braces, I would just say go for it. The results make a few weeks of discomfort totally worth it. Leave a comment if you have had/ or going to have braces? I would love to hear! Way to go, Adell! Congrats on getting through this! Your teeth look great and only a year?? So lucky! 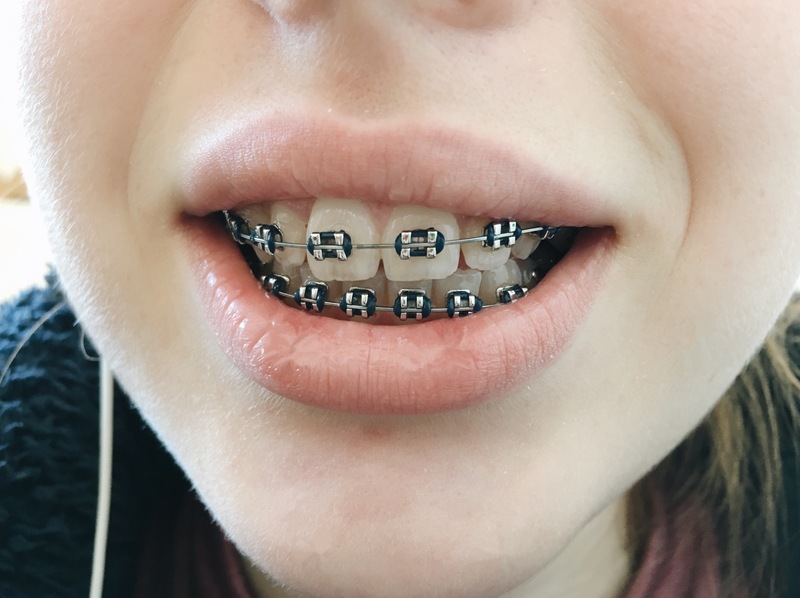 I had 4 brackets and an appliance in the roof of my mouth in elementary school for almost a year, then a full mouth of braces (and headgear at night) for my 3 years of middle school. Finally my teeth were straightened out and I haven’t worn my retainer, but they haven’t moved much at all- don’t follow in my footsteps though! My sister didn’t wear her retainer and her teeth completely reverted, so she’s getting Invisalign at almost 30 y.o. It was a year with 4 brackets and the appliance, then 3 years with full braces and nightly headgear- so a total of 4 years haha it was a journey! Wow! Your teeth look amazing! I had very similar teeth to yours and had to get four of my top teeth removed at one time! 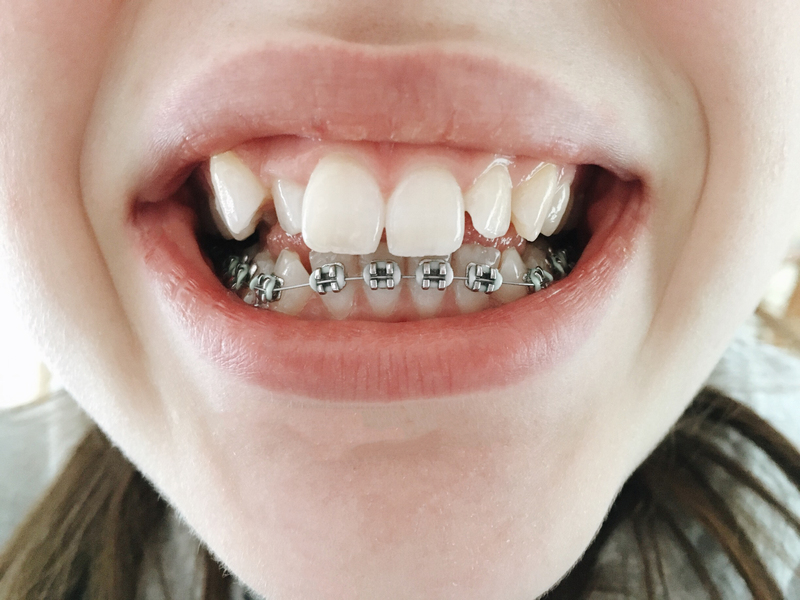 I totally agree with you that you loved the process of getting braces! I was the same. What a journey hey!